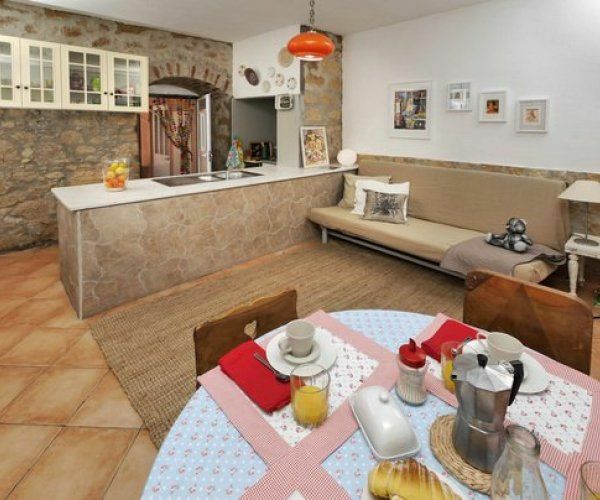 Our home is located in a tradicional portuguese Villa in one of the most popular streets, in the very heart of Lisbon, . It has 2 bedrooms, a living room, a equiped kitchenet, a bathroom and a sunny patio where you can listen to the morning birds or the Basilica da Estrela bell in the afternoon. It resembles a cool, relaxed, young country house with tradicional portuguese stone work across all the walls and patio. You can find references of our love for the portuguese culture, with a relaxed atmosphere and a vintage feel. You can experience our way of living and be a real Lisboneer. We are glad to share all of our space and all of the amenities with you. Other than that, whenever you need our help or advice. Our neighborhood is in the center of Lisbon, allowing you to go quicky whereever you want to go. It's known as the street of Lisbon's Antique stores and Galleries, is where it's located the Assembleia da Republica (Portuguese Parlament) and the house where Amália Rodrigues -Queen of Fado -lived, now turned into a museum. You have all you need for everyday life just a few steps away, Pharmacies, Health centre, ATM's, supermarkets and mini markets, bakery, Ice cream store, restaurants and cafés, gym, swimming pool, parking lot, public transportations, Parks. You are in Principe Real, only a few minutes away from Bairro Alto, Chiado, Baixa, Avenida da Liberdade, Avenida 24 de Julho e Santos. Since you are in the center, there are many public transportations nearby. Bus | at our doorstep | It takes you to Cais do Sodré or Santa Apolónia Station or Belém. Metro - Rato Station | 4 min. | it takes you to whereever you need to go in Lisbon. - 20 min. away from Baixa "Downtown Lisbon"
- 15 min. away from Avenida da Liberdade | main Avenue with all the designer stores. Our home is in one of the most popular streets in Lisbon. You have all you need for everyday life a few steps away, ATM's, supermarkts, restaurants and cafés, bars, bakerys, pharmacies, health center, gym, swimming pool, parking lot, parks. Enjoy your stay and take a little bit of Lisbon home with you.